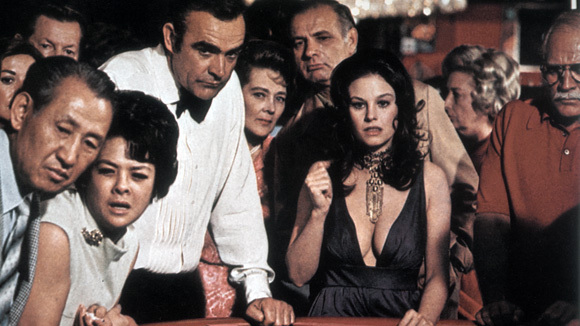 A noticeably older-looking Sean Connery's sixth and last "official" Bond movie (until he returned in the "unofficial" Never Say Never Again) is an entertaining confection that works best if you don't think about how totally ridiculous it is. Picking up from the death of his wife Tracy in On Her Majesty's Secret Service, James Bond is on a global manhunt for Ernst Stavro Blofeld, played this time by a cross dressing Charles Gray. Bond is assigned to chase a diamond smuggling operation, following the pipeline from South Africa, to Amsterdam, to Las Vegas. Blofeld's plot to use the stolen diamonds to create a frickin' laser beam in space will be familiar to everyone who saw the first Austin Powers movie, which parodies Diamonds Are Forever wholesale. The number of times the villains have Bond captured and merely have to SHOOT HIM to be rid of him, but instead choose an elaborate death trap that Bond easily escapes, makes one want to pull their hair out. Connery does seem to enjoy himself once again as 007 and even makes ample cracks about Bond's invincibility in the dialogue. It's a lot of fun to see glittery Las Vegas circa 1970. Lana Wood's two scenes as Plenty O'Toole totally upstage Jill St. John's turn as Tiffany Case. Both Bond Girls set franchise records for wearing the least clothing possible yet still technically being dressed. I also enjoyed Plenty O'Toole surprising defenestration (and Bond's nonchalance.) The less said about the two homosexual serial killers Bond faces off with at the end, the better.